Kent County Council has been criticised for refusing to overturn a ban on the promotion in schools of homosexual relationships. Section 28, the legislation which has prevented intentional promotion of such relationships in schools, is being abolished across England and Wales on Tuesday. But in Kent, the county council will retain the ban in a move which, it claims, has the backing of schools and parents. But gay rights groups have criticised the authority, accusing it of taking a confusing and old-fashioned stance. 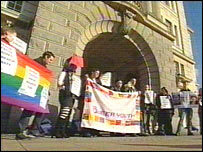 The removal of Section 28 was given the go-ahead in September when the Local Government Bill was given Royal Assent. The House of Lords had previously attempted to block the government's attempts to repeal the legislation. Kent County Council's policy, which effectively retains the legislation by still preventing pupils from being taught about homosexuality as an alternative to heterosexual relationships, was introduced in 2000. A spokesperson told the BBC: "We have had tremendous backing from schools and parents across the county, who, while wanting to encourage tolerance, are also clear they want to see family, Christian and other religious and traditional values emphasised." But the council's stance has attracted criticism from gay rights groups and from some of the county's teachers. Sue Sanders from the group Schools Out, an organisation for gay, lesbian and bisexual teachers, said: "I would argue what will happen with Kent is teachers will not feel confident, they will not know what to do and they will turn a blind eye, they will ignore stuff. "And when you don't tackle the issue you are colluding with it, you are enabling it to happen." A number of students gathered outside County Hall in Maidstone at the weekend to protest against Kent's stance. Mac Ames, of the Queer Youth Alliance, said: "When the suicide rate amongst young gay men is higher than ever before, it's imperative that our teachers are able to talk to their pupils confidently and impartially about sexuality and choices."